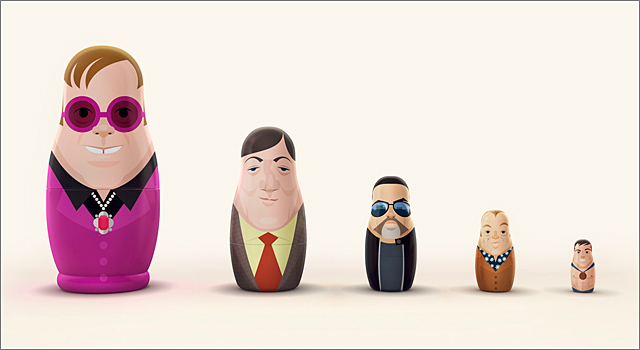 As a sign of solidarity with Russia’s besieged LGBT community, ad agency Mother London has created a set of nested dolls featuring well-known gay icons Elton John, Stephen Fry, George Michael, Graham Norton and Tom Daley (seriously folks… no Freddie Mercury??). Seven sets of the limited edition dolls will be auctioned off at torussiawithlove.co.uk between December 13th and 22nd with proceeds supporting the work of The Kaleidoscope Trust with the Russian gay community. In the spirit of giving, Mother London plans to deliver a set of the dolls to the Kremlin as well as the Russian Embassy in London this holidays.